Kyoto is one of the most popular destinations in Japan. You can still feel the ancient capital city of Kyoto from the nostalgic and historical townscape. Kyoto has many interesting museums, art galleries as well as its famous temples and shrines, while there also various seasonal events held in the city. Let’s check out popular sightseeing spots and must-see events. Yasaka Shrine is a Shinto Shrine in the Gion District of Kyoto. It is the head Shrine of other Yasaka Shrine, which are about 2300 in Japan. Yasaka Shrine has been also popular with the name of “Gion-san”. The name “Gion” is widely known for the “Gion Festival” in July too. 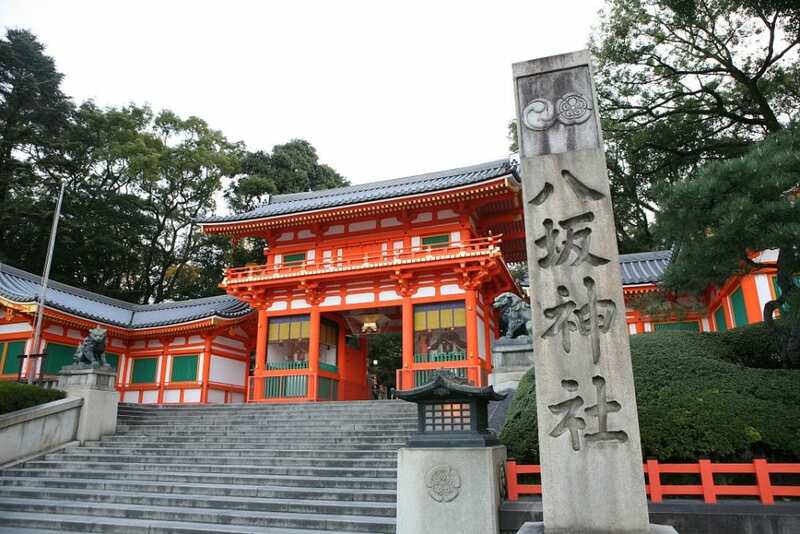 Yasaka Shrine is one of the representative shrines of Kyoto. From about 10 PM of the New Year’s Eve to the early morning of the New Year, Shijo Street leading to Yasaka Shrine becomes car-free, allowing many people to visit the shrine for Hatsumode. There is also “Okera Festival” on New Year’s Eve, which is believed to drive away the illness and evil energy, and bring you good luck. It has become one of the traditions to celebrate the New Year. The festival is free, so why not check it out! Fushimi Inari Taisha in Kyoto is the head shrine of over 30,000 Inari shrines across the country. Since early Japan, Inari was well known as patron of business and rice harvests. At the back of the Torii gates, stands the red Romon Gate, which was donated by Toyotomi Hideyoshi, and is designated as an Important Cultural Property. The main shrine structure with Hiwadabuki built in 1499 is also designated as an Important Cultural Property of Japan. At the end of the tunnel created by thousands of Torii gates is the place of worship. The shrine sits at the base of the Inari Mountain. On the mountain, which is 233m in height, there are many worshiping stones engraved with deities’ names (otsuka). The entire walk to the top is 4 kilometers and takes approximately 2 hours. This pilgrimage hike would be a good way of having a fresh start of the New Year. Kiyomizu-dera Temple is known as cherry blossoms and autumn leaves viewing spot. For seven days from New Year’s Day, Shusho-e is held in the Main Hall to pray for a good harvest, the safety of loved ones, good business and world peace. Wishing for perfect health, visitors can receive gou-houin, a stamp on the forehead and gokozui, a sip of healing water. Kiyomizu-dera Temple has many Important Cultural Properties such as Kokuho Nio-mon in the Main Hall, the Three-Stories Pagoda and Shoro. It was also registered as a UNESCO World Heritage site in 1994. Do not miss experiencing the traditional annual events and exploring the temple. 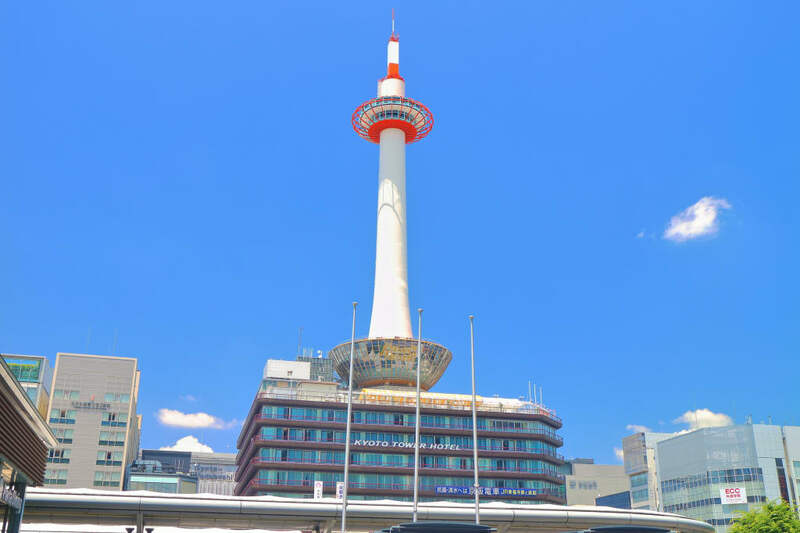 The 131 meters-tall Kyoto Tower symbolizes a lighthouse that illuminates the landlocked city of Kyoto. “Hatsu Nobori”, an event to see the first sunrise of the year from the observation deck is held every year. Many people visit to enjoy the view of the first sunrise from the tallest building in Kyoto, while also enjoying the panoramic view of the city laid in grid pattern. Also, there is even “Tawawa-chan Shrine” on the observation deck, so visitors can perform Hatsumode, as well as get “Tawami kuji” and “Tawawa-chan ema” to dedicate to the shrine. The tower light changes to orange to celebrate and wish for good year, allowing visitors to have a special New Year. In case of using public transportation, please check in advance, as sunrise event is early in the morning. Depending on the weather condition, sunrise may not be able to be seen. Yoshimine-dera Temple is located hallway up Mt. Shakadake in Nishiyama area of Kyoto, covering about 30,000 tsubo (25 acres) of land. 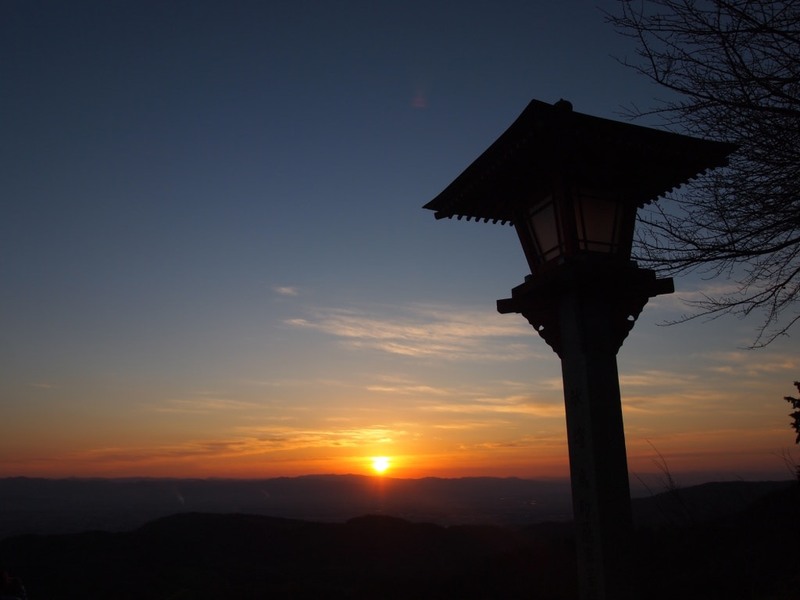 Yoshimine-dera Temple is a popular first sun rising viewing spot as you can overlook the city of Kyoto as well as Mt.Hiei. The incredible view of sunrise creates a beautiful harmony with magnificent nature and mountains, which has been attracting people for a long time. The scenes of the sunrise through the Higashiyama Mountains used in a Hollywood movie “SAYURI” were shot at Yoshimine-dera Temple. The temple also has the famous “Yuryu no Matsu”, a 600-year-old tree, which is listed as a national natural monument. There are also “Taho-to” (Two-storied Pagoda) and Daigensuimyo-o designated as Important Cultural Properties, so visitors can enjoy both exploring the historical temple and sun rising at the same time. ・From JR Kyoto Line “Mukomachi Station” , take Hankyu Bus and get off at “Yoshiminedera” stop, which takes about 30 minutes. Then it is 8-minute walk to the temple. “Sanjusangen-do” means thirty-three intervals. The temple was named after the architecture; there are thirty-three spaces between columns lining the hall from north to south. “Sanjusangen-do” is officially known as “Rengeo-in”. 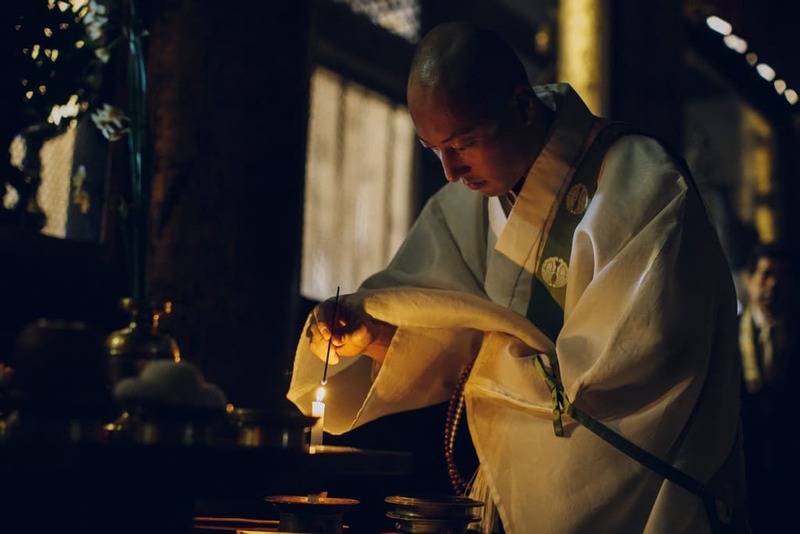 There, worshippers are splashed with pure water, which was prayed for seven days in front of Gohonzon, with a sacred branch of willow tree to cure illness. 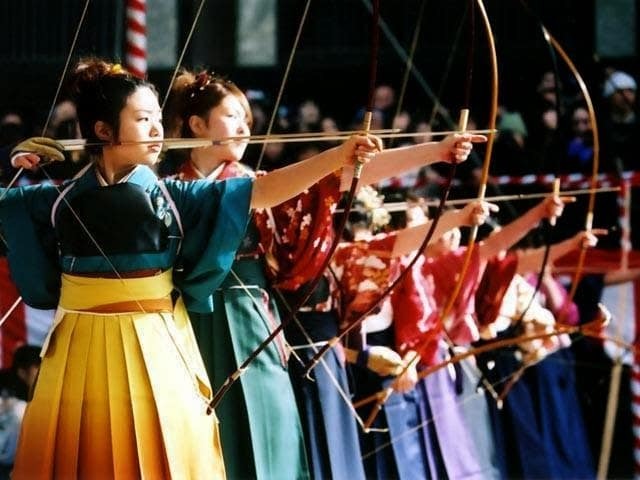 The event is called “Yanagi-no-okaji and National Archery Competition”. Archery competition known as Toshiya has been held since 1600, which about 2,000 high-skilled players who celebrate the age of majority (20 years old) participate each year. The female participants are wearing spectacular furisode kimono and hakama pants, which have become one of the winter features of Kyoto. You might feel energized and refreshed if you see the elegant and gallant archers. The Shichifukujin (Seven Lucky Gods) have been worshipped among mainly farmers and fishermen since around 1300. Over time, Pilgrimage of the Shichifukujin had gradually spread all over Japan. The Shichifukujin Meguri is taking place across the country, but it is said to have originated in Kyoto. 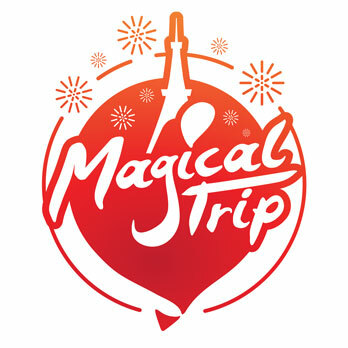 By participating in this tour, you can collect “goshuin” (red stamps). These days, it is also getting popular among “goshuin girls”, who collect goshuin from temples and shrines. 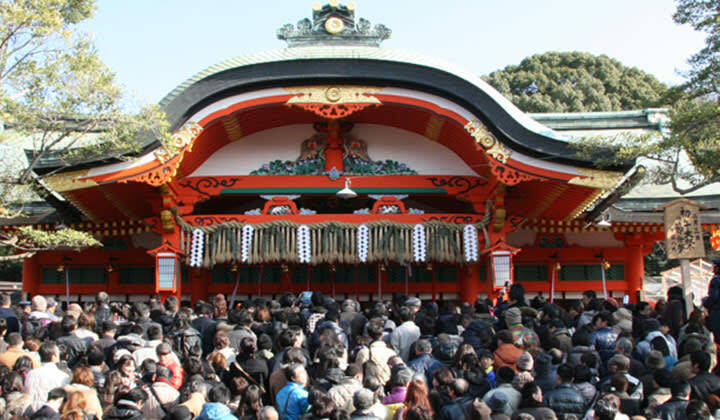 It is also believed that a visit to temples of lucky gods of Kyoto in January brings happiness throughout the year. Particularly, it is often done on January 17, which is a holiday with the number “7” after the New Year. Shichifukujin Meguri is done in a day. The temples and shrines visited are following seven places; Ebisu (Ebisu Shrine), Daikokuten (Matsugasaki Daikokuten), Bishamonten (Toji Temple), Benzaiten (Rokuharamitsu-ji Temple), Fukurokuju (Sekizan Zen-in Temple), Jurojin (Kodo) and Hotei (Manpuku-ji Temple). Why not go for Shichifukujin Meguri when you visit Kyoto and bring you more happiness? ・Take #206 City bus from JR Kyoto Station and get off at “Kiyomizu-michi” stop. It is seven-minute walk from the bus stop.